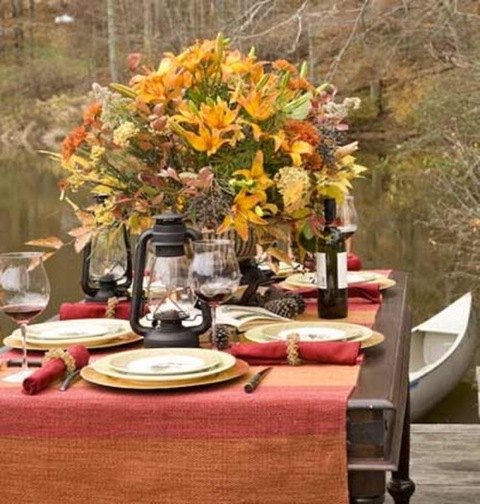 photo: myhomeideas.com We spend so much time focusing on that Thanksgiving meal, we sometimes forget autumn's harvest yields delights as satisfying as those found in midsummer. Sweet potatoes, pears, cranberries, apples, onions, garlic, squash and pumpkin are the perfect foods to turn to as the temperatures drop and we crave denser, more energy rich food. Poultry and pork are especially well matched with these fruits and root vegetables, especially when a little cinnamon or ginger is added to spice things up. And the chilly winds of October and November are the perfect excuse to whip up a hot creamy soup while savoring the exquisite aroma of mulled cider simmering on the stove. It's also the time when walnuts are harvested along with sunflower seeds, two of the most nutritious and satisfying natural snack foods available throughout the year. The following recipes are only a brief sampling of the riches of autumn. Serve them together at a single fall feast, or enjoy them one at a time. As the days grow shorter and colder, few things satisfy like a steaming bowl of soup. This deliciously creamy soup is not only filled with vegetables and nutritious flax seeds, but antioxidants, and vitamins A and C. And the sweet potatoes are low on the glycemic index making this an especially healthy choice for either a first course or an entire meal. Cut cauliflower into bite-sized pieces. Place cauliflower onto ungreased cookie sheet and lightly drizzle or mist with olive oil. Sprinkle cauliflower lightly with garam masala or cayenne, sea salt and garlic powder. Place into the oven and let bake until golden brown on the tops and tender, about 20-30 minutes. In large stockpot, add water, boullion, sweet potato, onion, garlic powder and bring to a boil. Reduce heat and allow to remain at a constant simmer until sweet potatoes are tender. 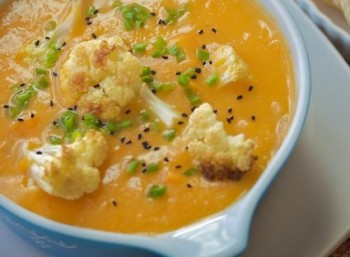 Add in cooked cauliflower and divide soup into 2 parts. Let soup cool and then blend one part soup in blender until very smooth. Combine with the unblended soup and stir. Sprinkle with some chives and flax seeds on top, then salt to taste. Serves 4. 225 calories per serving. 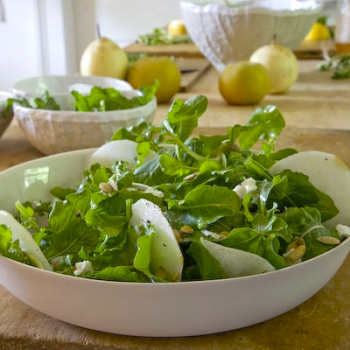 Don't be intimidated by celebrated Chef Morimoto's recipe for Asian Pear Salad. Although it is a customer favorite at his signature restaurant Morimoto in New York City, this refreshing Japanese dish is simple to prepare. And don't worry if you can't find mache (lambs lettuce) at your local grocery store. Arugula, radicchio, Boston lettuce or endive can be used instead. However mache is a tender lettuce with a pleasantly nutty flavor, so if you do have mache available, give it a try. It's a perfect complement to the crunchiness of an Asian pear. Cut the Asian pear into julienne strips. Place in cold water with the lemon juice and reserve. For the vinaigrette: In a saucepan, bring plum wine to a simmer and reduce to 1/4 cup. Combine with the vinegar, minced shallot, and the olive oil. To plate, toss the julienned Asian pear with the mache, chives, and enough vinaigrette to coat. Adjust seasoning. Place in the center of a plate, drizzle with remaining vinaigrette and sprinkle with tasted hazelnuts.. This is a great entree for those who have a fondness for dishes that are both sweet and salty. Please note that cranberry juice cocktail can be used in place of the port. 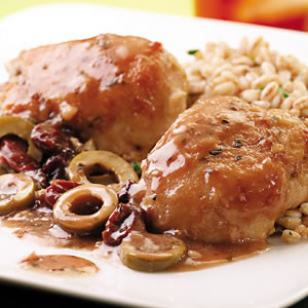 And if chicken thighs are not high on your list, substitute chicken breasts or even lean pork. Season chicken with salt and pepper on both sides. Place flour in a shallow dish. Add chicken and turn to coat. Measure out 4 teaspoons of the flour to a small bowl and whisk in 1/4 cup port (or cranberry juice cocktail) until smooth. Discard the remaining broth. Heat 1 tbsp oil in large nonstick skillet over medium heat. Add the chicken and cook until browned on the outside and no longer pink in the middle, about 4 minutes per side. Transfer to a plate. Add the remaining 1 teaspoon oil and garlic to the pan. Cook, stirring, until fragrant, about 30 seconds. Add the flour-port mixture, the remaining 1/2 cup port (or juice), broth, dried cherries (or dried cranberries), olives, vinegar, brown sugar and oregano. Return the chicken to the pan along with any accumulated juices. Turn to coat with sauce and cook until heated through about 2 minutes. Recipe courtesy of eatingwell.com - March/April 2008. This quintessential dish for autumn is filling, tasty and easy to prepare. And it features one of the season's most versatile vegetables. I found this recipe on Pinterest, a great online resource for avid cooks. Kalyn, in turn, adapted it from a recipe found on Epicurus.com. Once you've tried this recipe, feel free to pass it on. Btw, this dish can be prepared ahead of time and reheated. Something to think about when planning that Thanksgiving dinner. Mix together the olive oil, rosemary, and 1 tablespoon balsamic vinegar. Toss squash cubes with the mixture. Arrange the squash on a cookie sheet. Roast 20 minutes, then turn squash and roast for 20 minutes moire, or until squash is very soft and starting to get slightly caramelized. 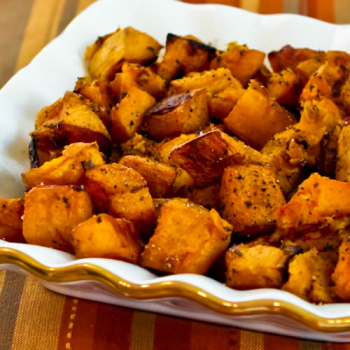 remove from oven and toss squash with additional 1 tsp balsamic vinegar, sea salt, and pepper. You can mash slightly if desired, or serve chunky. 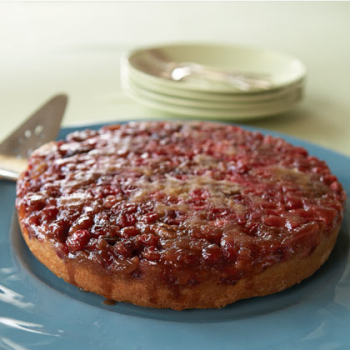 What better way to celebrate the Thanksgiving season than with a traditional favorite such as upside-down cake. But instead of the usual pineapple, this recipe calls for cranberries, giving it a New England twist. To get the best flavor, make certain the cranberries are as fresh as possible. Family Fun Magazine suggests placing them in water first. The fresher the cranberry, the more it will bounce and float in the water. And don't be afraid to serve this topped with whipped cream, or even a scoop of ice cream. Melt 2 tablespoons of the butter. Pour the butter into a 9-inch springform pan. In a mixing bowl, combine the cranberries and the brown sugar, than scatter the mixture on top of the butter. Sprinkle on the pecans. Beat the remaining 4 tablespoons of butter and sugar at medium speed in a medium mixing bowl until well blended. Beat in the eggs one at a time, then beat in the vanilla extract. Combine the flour, baking powder, and cinnamon in a small bowl. Stir well. Beat 1/3rd of the dry ingredients into the creamed mixture, followed by half of the buttermilk. Continue alternating in this way until the remaining dry ingredients have been beaten in. Spoon the batter evenly over the cranberries. Let the cake cool in pan for about 5 minutes, then invert the cake onto a serving platter and remove the pan. Hot apple cider is always a popular choice, whether it is served at the end of the meal, or as an accompaniment to any tasty cold weather dish. And if your dinner guests are all adults, feel free to spice up the cider with a little brandy, rum or even bourbon. 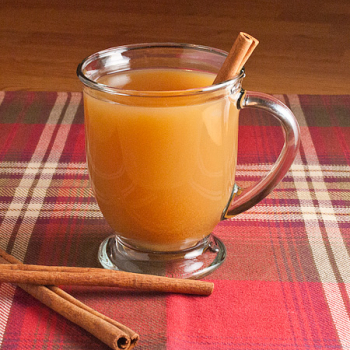 Pour apple cider into a 3-quart saucepan, cover, and turn the heat to medium-high. While the cider heats up, use a vegetable peeler to peel away a couple of thick strips of peel from the orange. Place the orange, orange peel strips, the remaining cloves, and the remaining ingredients into the sauce pan with the cider. Keep covered and heat the mulled cider mixture to a simmer. Reduce heat to low. Simmer for 20 minutes on low heat. Use a fine mesh sieve to strain the cider away from the orange, cloves, and other spices. Serve hot, adding a cinnamon stick to each cup.